On a recent trip to Philadelphia I shocked more than one person by asking if I could order a Chicken Philly Sandwich when we were at a restaurant. I didn’t mean to offend anyone, but I honestly prefer eating a Chicken Philly Sandwich over a beef sandwich. Chicken Philly sandwich ready to be eaten. The answer in all but one establishment was a cold-hearted NO! In fact, I couldn’t even order a Philadelphia Cheesesteak with only half of it with cheese. Even though my husband and I were going to split a sandwich, and he can eat cheese but I try to limit my dairy intake, the server told me it had to be ‘all or nothing’! So I became super hesitant to ask for anything out of the ordinary, especially a Philly sandwich made with chicken! 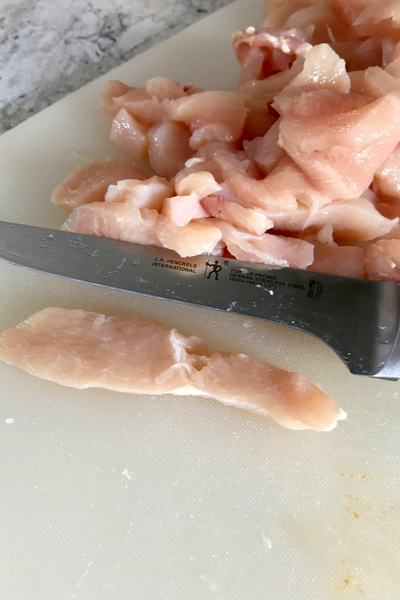 Slice chicken breast in thin strips and then in bite size pieces for easy eating. However, that changed when we went to a local pub and tavern on the west side of Philadelphia. I honestly think the staff could see the defeated look on my face from being rejected all weekend. When the server asked what I would like to order, I chuckled under my breath. My husband laughed and encouraged me to give it another try. So after explaining the entire situation to her, she agreed to ask the chef if the substitution was possible. 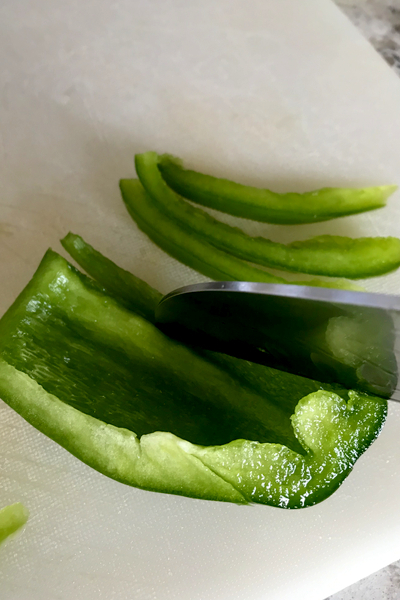 Slice the green peppers thin enough so that break down easy during the cooking process. A few minutes later she returned to our table with a big smile on her face. The chef replied, “Whatever the customer wants, the customer gets”. I was so relieved that I was able to sit back, relax and enjoy the company of Philadelphia. When my sandwich was brought to the table it looked absolutely delicious! 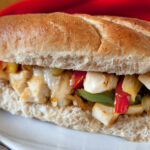 Oregano makes all the difference in the flavor of this chicken Philly sandwich! 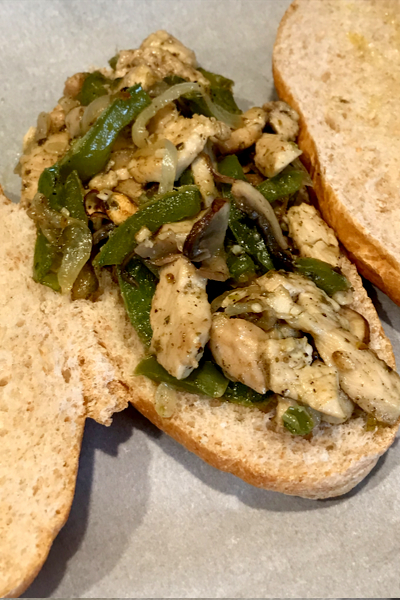 Bits of chicken, peppers, and mushrooms were oozing outside of a large hoagie bun. The only thing that held them together was the white cheese that encased not only the top of the sandwich, but down the sides as well. And to top if all off, the bun was perfectly toasted! Lightly golden brown on the inside the bun with a slightly darker brown around the edges of the bread. This was exactly what I had been waiting for! 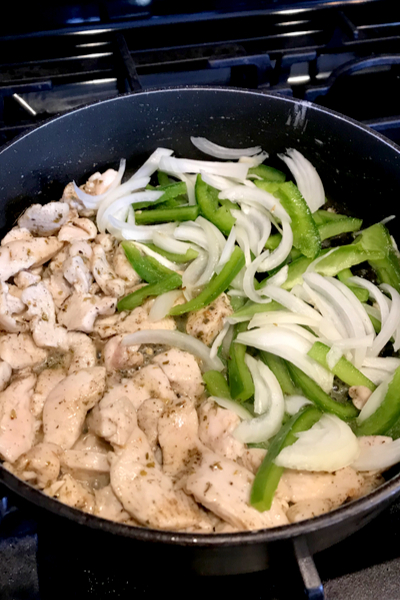 Cook the peppers and onions beside the chicken. One bite into it, and I was in heaven! This was exactly what I had been dreaming of! I sat and enjoyed the entire sandwich, not wanting it to end. But I knew it had to at some point. It was then that I decided that I had to make my own chicken Philly sandwich at home! After I got back home I went to work at recreating this delicious sandwich. Mix everything together and add the mushrooms with some water to soften. My first attempt resulted in a bland chicken Philly Sandwich. It was just okay as it lacked any real flavor. Therefore, I knew that I had to add more seasoning to the chicken as it cooked. After doing some research on the best Philly cheesesteak sandwiches I decided that I would add dried oregano to the chicken as it cooked. Pile the filling on top of one side of a hoagie bun. 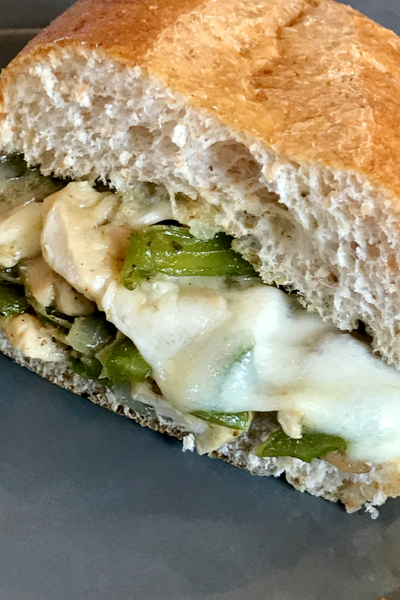 The results — the perfect Chicken Philly Sandwich! I couldn’t believe how much the oregano added additional flavor to the sandwich. Topped with a few slices of melted provolone cheese and it was a match made in heaven! If you love all sorts of sandwiches you will love our Authentic Shrimp Po’Boy and our Kentucky Hot Brown recipes. And if you are more of a traditional Philly cheesesteak type of person, you have to give these low-carb Philadelphia Cheesesteak Stuffed Peppers a try! Broil in the oven just until the bun begins to brown and the cheese is melted. 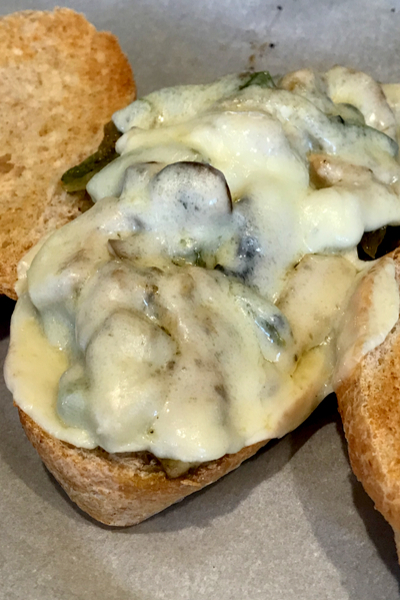 A delicious take on the Philadelphia Cheesesteak but this time made with chicken instead of beef! Just as delicious and a little healthier! In a large skillet add the olive oil and heat until hot. 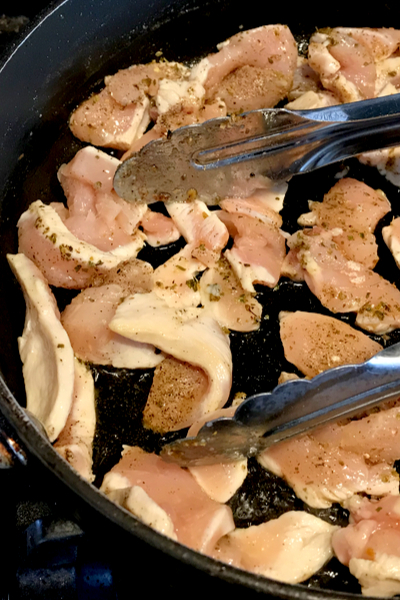 Add the chicken, salt, pepper, onion powder, and oregano to the skillet and cook over medium heat until the chicken is cooked through but isn’t browned yet. Move the chicken over to one side of the skillet and turn the heat up to medium-high. Add the onions and peppers to the empty side of the skillet and cook for 3-4 minutes or until they soften. Stir in the garlic with the onions and peppers. Cook for an additional minute. 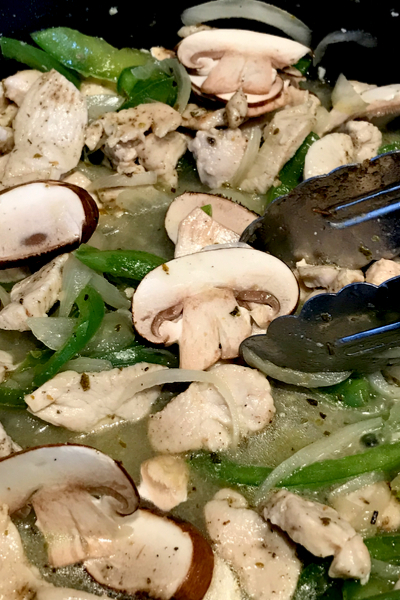 Stir all the ingredients together in the skillet and add the water and mushrooms to the pan. Stir and cook until the onions are caramelized, and the chicken pieces are golden brown. Remove from the heat and set aside. Slice the hoagie rolls and place them opened on a parchment lined baking sheet. Brush the insides of each roll with a little olive oil or butter. Divide the chicken mixture and place it on the bottom half of each bun. Place two slices of cheese over the chicken on each bun. Broil the sandwiches open-faced for a minute or two until the cheese is melted but not yet brown. Add the top bun and serve immediately!